Define and explain cash book. How a cash book is balanced. Prepare a format of the simple cash book. Cash book is a book of original entry in which transactions relating only to cash receipts and payments are recorded in detail. When cash is received it is entered on the debit or left hand side. Similarly, when cash is paid out the same is recorded on the credit or right hand side of the cash book. 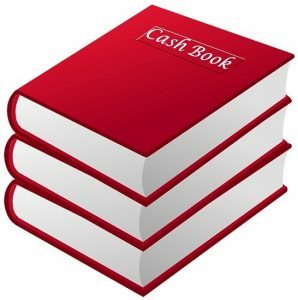 The cash book, though it serves the purpose of a cash book of original entry viz., cash journal really it represents the cash account of the ledger separately bound for the sake of convenience. It is more a ledger than a journal. It is journal as cash transactions are chronologically recorded in it. It is a ledger as it contains a classified record of all cash transactions. The balances of the cash book are recorded in the trial balance and the balance sheet. For Every entry made in the cash book there must be a proper voucher. Vouchers are documents containing evidence of payment and receipts. When money is received generally a printed receipt is issued to the payer but counterfoil or the carbon copy of it is preserved by the cashier. The copy receipts are called debit vouchers, and they support the entries appearing on the debit side of the cash book. Similarly when payment is made a receipt is obtained from the payee. These receipts are known as credit vouchers. All the debit and credit vouchers are consecutively numbered. For ready reference the number of the vouchers are noted against the respective entries. A column is provided on either side of the cash book for this purpose. The cash book is balanced at the end of a given period by inserting the excess of the debit on the credit side as “by balance carried down” to make both sides agree. The balance is then shown on the debit side by “To balance brought down” to start the next period. As one cannot pay more than what he actually receives, the cash book recording cash only can never show a credit balance. I want to be a member of your organisation. please accept my request here. Hi! Rubab. Ur english is very good but in this article you made some mistake. So i requeat you to take care of it in ur future article.